At the start of this novel, our narrator Ramon Bolio, previously known as Frederick Boyle tells us that he is starting to write his autobiography. He begins at the age of eighteen, when in 1972 he jumped ship in Uruguay and then embarked on his early adult life in Montevideo. Soon, he meets and is taken in by Julio who immediately renames him as Ramon Bolio. 1972 is his new beginning in a country where he does not speak the language and neither does he know it well; it's a country on the brink of dictatorship and with an active resistance movement. It's a country where people go missing, are tortured and are killed. His autobiography is not a straightforward chapter by chapter chronological account of his life either; it is cut through with matters of the present day, as if Ramon is chatting with the reader as he goes along. And if the past environment was not bad enough, his present day is also not running smoothly. His writing is interrupted by his younger brother Stephen who is fretting because his step-daughter Hannah has gone missing. Ramon rushes into reassurance mode as Hannah has done this before. But it's not too long before the police are called in. With Stephen and his wife not being the brightest, and also suffering the loss of Hannah, Ramon serves as their protector and advocate during proceedings. Back in Montevideo, Ramon discovers the tango and he works to become a Milonguero, a master of the dance. Throughout the novel, references to what a good tango should be serve as metaphors for life and in particular, how Ramon's life is shaped over the years, based on his experiences in Uruguay. As a narrator, there is an initial eerie feel to Ramon, a sense of not really knowing him as he recalls being a cocky young man who also seems to have been prepared to be swept up by those he encountered. It is not clear what he has learned and what is the core of him. There is also a sense of detachment, as if Ramon, in his writing, is actually a spider on the wall, looking down on his life and directing the prose. 'I don't want a child,' she said. 'It's the end. Motherhood is measuring your days in fluids - tears, blood, milk, spew and piss. The dress was black and elegant with a long full skirt, Empire line, made of soft chiffon with strappy lacing in the back, and Florencia was a lump in it. It is simply too hard - call it impossible - to say what this novel achieves without giving the plot away. Essentially, it is a story of finding manhood in a country at risk, in a culture at risk, when life could prove to be all too short and the experience of life matters more than at any other time or place. In Ramon: what makes the man? And what did he learn of life? He certainly learned the tango and how it reflects on life, but how does his inner core direct him in later life? Obviously, you would have to read the novel to find out. 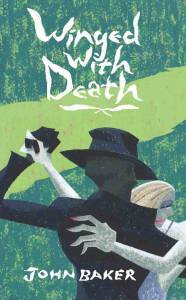 John Baker has written a good, evocative and also provocative novel with WINGED WITH DEATH.